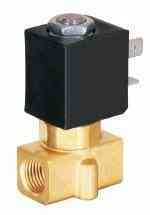 1/4" PSM222 Series - 2/2 N/Closed, Direct Acting Solenoid Valve. The Valve Body is made of BRASS. Seals are NBR - up to 80 Deg C.Orifice 2.5 mm.The Operating pressure Range is 0 to 10 Bar.